Earth has 7 major plate tectonic boundaries and 10 or so minor ones. 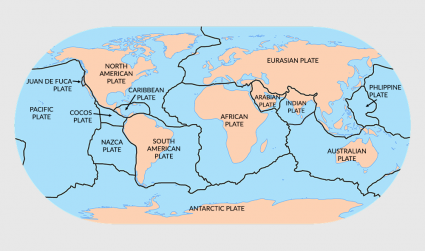 Of the 7 major plates, the South American Plate is the smallest plate right after the Indo-Australian Plate. Earth’s tectonic plate boundaries consist of both continent and ocean crust. 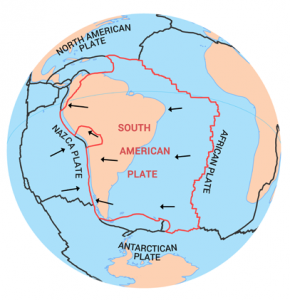 For example, the South American Plate contains a large portion of the Atlantic Ocean within it. Plate tectonics are never idle. 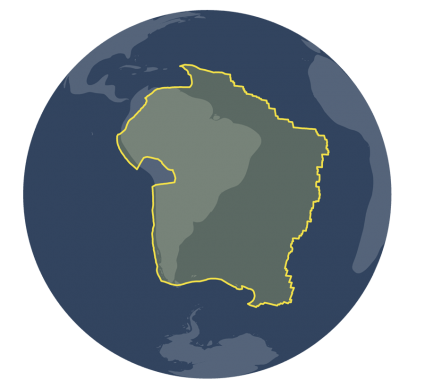 For example, the South American Plate moves at an average rate of about 3 centimeters per year. That’s about how fast your nails grow each year. The South American plate is a major plate that includes the continent of South America and a large portion of the Atlantic Ocean. At the west side of South America, it experiences devastating earthquakes due to the convergent plate tectonic boundaries. But the eastern edge lies in the Atlantic Ocean at a divergent plate boundary. Along the African Plate boundary, these two plate boundaries pull apart from each other. This diverging plate motion creates some of the youngest oceanic crust on the planet. At about 43,600,000 km2 in size, it’s smallest major plate on Earth. Brazil, Argentina and the Atlantic Ocean sit on the South American plate. What about some of the other major plates? Take a look at some of the hand-picked articles below.